Here you can see the top quality craftsmanship that goes into our desk drawers. They feature sturdy dovetail construction, and are made of solid wood. The drawer bottoms are made of solid (oak, cherry, walnut) veneer. You can also see our full-length metal drawer roller slide, and the included rails for hanging files. 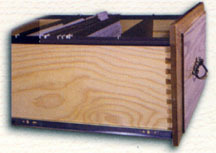 Raised panel version of the drawer is shown.